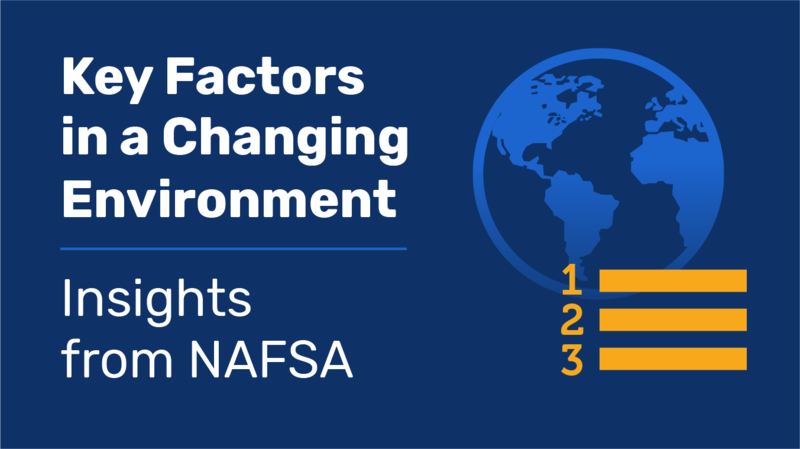 The following article originally appeared in the September/October 2018 issue (Linked Here) of NAFSA’s International Educator and has been reprinted here with NAFSA’s permission. Let us know if you have other factors that you weigh as part of your enrollment planning. Leave us a note in the comments below. The labels—disruption, tsunami, perfect storm —have become so familiar that they are now clichés, but change on a grand scale has come to define higher education today. Significant shifts in the landscape have become routine. Among many others, these six factors alone are more than enough to keep university leaders on edge. The Western Interstate Commission for Higher Education (WICHE) projects that after 15 years of steady growth in the number of high school graduates, higher education faces stagnation in the pool of traditional students. Compared with 2013, a peak year, WICHE finds that U.S. high schools will graduate fewer students every year between 2014 and 2023. One key reason is the decline in births after the Great Recession. Schools in the Northeast and Midwest regions of the United States will be particularly challenged. WICHE projects that the number of white students will decline, while colleges will see more Hispanics and Asian/Pacific Islanders. That’s in addition to trends that show more adult and first-generation college students on the path to higher education. This trend suggests that some universities may need to allocate additional and different resources to matriculation and degree completion in the future. difference. The squeeze on tuition revenues has pushed many universities to pursue new revenue streams, including developing commercial properties and enhancing fundraising. Act that could constrict federal financial aid for students and, potentially, federal support for university research. design, and learning methodologies. The rapid expansion of online learning is bolstering enrollment for many institutions, but also creates new competitive tensions between institutions and with vendors in the private sector. Recent surveys and polls of public opinion across the United States show that higher education is held in lower esteem than it once enjoyed. Students, parents, legislators, and other key stakeholders are more skeptical today about the value of college and its return on investment.